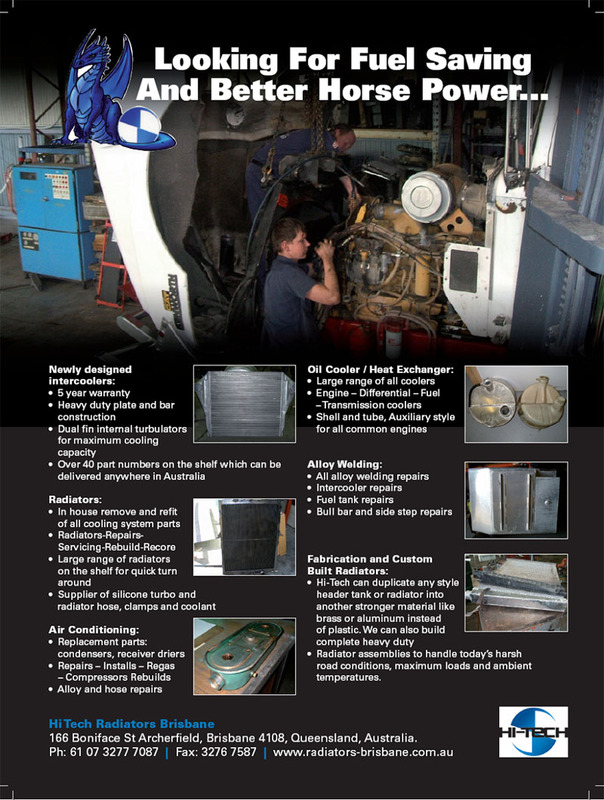 Truck Radiators Brisbane, Queensland, Australia - Man, Hino, Mitsibishi, Isuzu, Nissan UD, International, Ford, Kenworth, Mack, Western Star, Volvo, Iveco, DAF, Freightliner, Mercedes, Sterling, Scania. Truck radiators Brisbane Queensland, Australia Man, Hino, Mitsibishi, Isuzu, Nissan UD, International, Ford, Kenworth, Mack, Western Star, Volvo, Iveco, DAF, Freightliner, Mercedes, Sterling, Scania and Caterpillar. Ph: 07 3277 7087 166 Boniface St Archerfield Brisbane. We Freight Australia wide in 24hrs to Sydney, Melbourne, Brisbane, Perth, Adelaide, Darwin, Tasmania, We have the largest stock range. See us first for the best deal in Aus. WORKSHOP SECONDS CORE SALE SPECIALS. Download list click on icon. Truck radiators are the most common rebuilt item that comes through our workshop due to the road conditions of today causing a lot of premature failure of many items just like the radiator, intercooler and condenser. This is mainly caused by vibration, rubber supports, mounts wearing and cracking not to mention the horse power of today's trucks and the load rating they carry takes its toll on items such as the radiator and the intercooler which are both constantly going from hot to cold all the time. What this causes is thermal expansion in the join between two joint materials to what we call tube to headers causing either loss of coolant or loss of air. Hi-Tech Radiators are more then capable of repairing these problems but are not a guaranteed repair. Normally we do just enough too allow the customer time to keep running his truck until they are able too afford a new more improved Hi-Tech replacement, then we can supply with all the improvements needed to handle today's working conditions here in Australia. With over 130 part numbers & growing. We can turn around a Charge air cooler replacement within the day with ease with a network of shops & freight to get to & from your workshop. Other reoccurring problems in trucks is cracking of plastic top tanks know more commonly to happen to late models that come out as original equipment with plastic top and bottom tanks with an aluminium core. This is mainly done because those two materials are cheaper then copper and brass also far more lighter giving them allowance for more trailer load capacity. When a plastic top tank cracks and the rest of the core is still ok we then give you the customer a couple of options other then just replacing the complete radiator that can become quiet costly at times. New Alloy side tank added to this radiator. 2. Fabricate both the top and the bottom tanks to suit core. This will only be done if one of Hi-Techs experienced staff members believes they may be any issues in the near future with the bottom tank cracking as well. Normally this does not happen because the temperature hits inlet tank or better know as the top tank, even if it is a cross flow or a vertical flow fast at about 20 - 30 degrees hotter then the bottom/outlet tank allowing the heat in the water to decay and harden the plastic as the top. The way we can tell if a tank is close to cracking is looking for slight fractures in the plastic, discolouration of tank or once the tank has been removed from the core and is found too be very hard when you squeeze it. That's when we replace both tanks. 3. Another option replace top and bottom tanks with the core to suit this will give you the customer a good warranty and peace of mind knowing that your truck radiator has been fully replaced, using thicker more robust materials made from Australian companies that know and understands Australia s climate and road conditions. Other problems that can occur on trucks is header tanks or better know as overflow bottles cracking or corroding weather they are made out of alloy, plastic or steel. 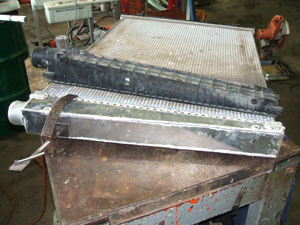 Hi-Tech Radiators can either repair or remanufacture a new tank out of stronger more robust material.